Look@OurBlog: What do your children carry? What do you want your children to carry with them? All of us have our own sayings and things we want our children to remember, no matter where they go, or what they do. Words we repeat to them and they know by heart. Words we may not need to say, but always do. 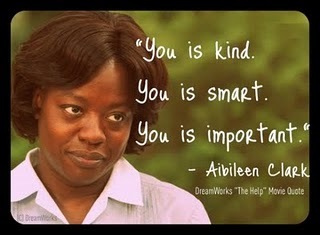 In The Help Aibileen repeats through the movie to the children she is looking after "You is kind. You is smart. You is important." The little girl knows it by heart and says it with her. She tells her to remember it. It is a beautiful message to a little girl whose mother doesn't always make her feel important. A saying friends have learnt from daycare, has become my girlfriend's mantra for her girls when they fight. "You get what you get, and you don't get upset." The girls know it and repeat it often. My son's first words were "love vu". He didn't say Mum or Dad until much later. I was constantly telling him I loved him and now when he kisses me goodbye at school, I'll ask him what he has to remember (normally referring to books, or lunch order, whatever) and he replies "Mummy loves you." This is what he carries with him. I remember my Grandma used to tell me "If you can't say anything nice, don't say anything at all." I often used it as an excuse not to tell her something and later found out there are some times you need to say something that isn't nice. She also taught me to treat other people the way I would like to be treated. This is what I carried and still do. We all hope our children know they are loved. Whatever else we want them to carry with them is up to us. From the moment they are born babies hear and learn, so give them something to carry with them, even if they can't quite understand it yet, they will.